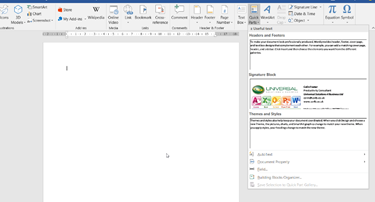 I suspect that we all have some “standard” phrases or paragraphs of text that we regularly reuse; perhaps hunting down the exact set of words that we want to use from a previous document and then copying & pasting into our current one. Wouldn’t it be easier if there was a quicker way to do this? Well there is by making use of Word’s Building Blocks. 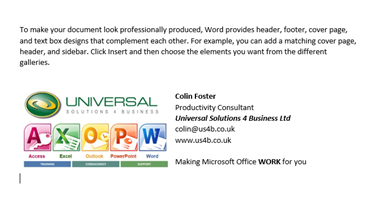 The name is pre-populated with the first few characters from your selected text which should be changed to something a little more useful. 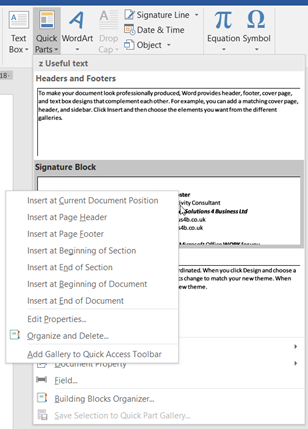 Because it’s already highlighted, you don’t need to delete the existing text first, you can just type the new name. Gallery – Building Block Galleries are simply subdivisions of the entire set of Building Blocks. 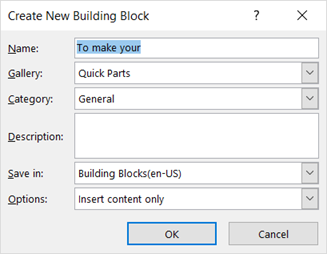 I leave the default to Quick Parts – why bother spending the time to change things if you don’t need to? 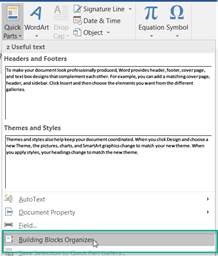 Category – When saving a Building Block, Word prompts users to save it in a Category in addition to a Gallery. Categories are simply additional means of grouping Building Blocks together for ease of recall. 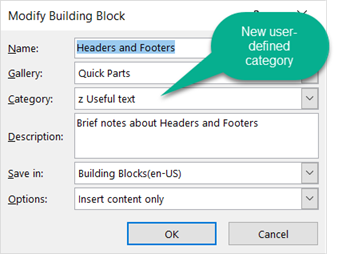 Word provides only one Category by default – “General” – but users can create their own categories as necessary. For instance, someone involved in preparing sets of financial statements might choose to have a gallery for Cover Letters, a gallery for Financial Statements, and a gallery for Footnotes. 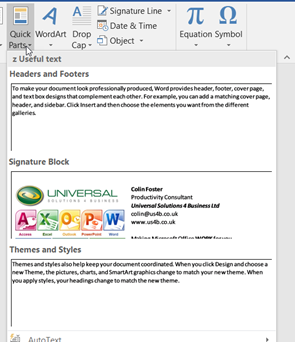 Save in – Word saves Building Blocks in template files. 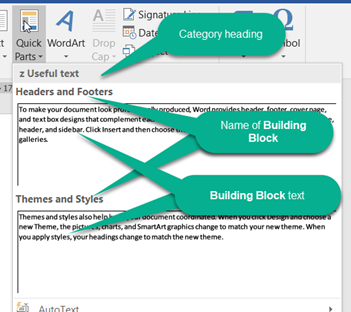 More specifically, Word saves Building Blocks by default in the Building Blocks.dotx template. 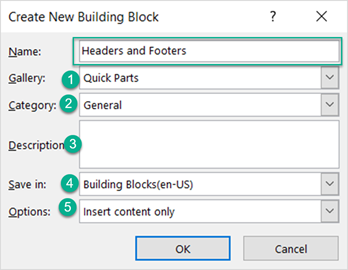 You may also choose to save new Building Blocks in the Normal.dotm template or any other global template so that the Building Blocks are accessible when you are working in any document. 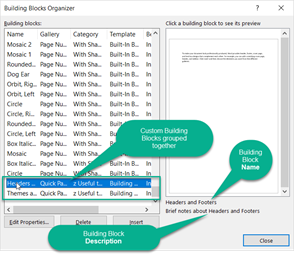 On the other hand, you may save the Building Block to a specific document template, and it will then only be accessible to any document that uses that specific template. 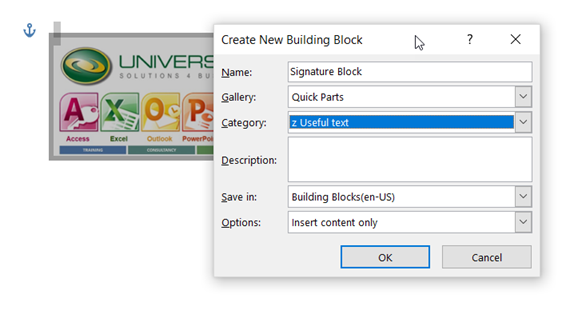 So far, we’ve just created the Building Blocks… so how do we use them? 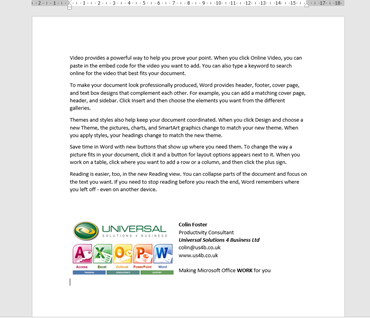 This entry was written by colinfoster, posted on March 8, 2018 at 4:03 pm, filed under Microsoft Word, Tips and Tricks and tagged AutoText, Building Blocks, Word. Bookmark the permalink. Follow any comments here with the RSS feed for this post. Comments are closed, but you can leave a trackback: Trackback URL.